Following the 2001 census, the British Government was astonished to discover that it had 390,000 Jedi Knights amongst its citizens. This is much larger than the British Army itself, notwithstanding that a large proportion of the Armed Forces will need to be retained to cover any Fire Fighters strikes that may take place during the conflict. As a result the Government has decided to send the 390,000 Jedi Knights over to Iraq to fight Saddam Hussein instead of the regular army. 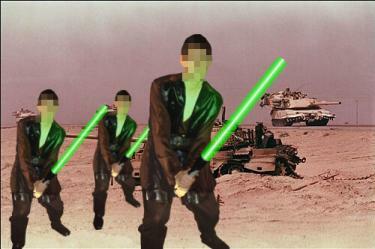 New Government Plans means that nearly 400,000 British Jedi Knights will be fighting alongside American Forces in Iraq. �There are many advantages to this situation,� Defence Secretary Geoff Hoon told us, �For a start we don�t have to worry about the weapons not working in the desert conditions � we�ve all seen the Qui-Gon Jinn / Darth Maul duel on Tatooine. Both weapons functioned perfectly. �There is obviously the combat ability of the Jedi Knights as well. I mean, if an inexperienced Jedi Knight can out fight his father, the greatest Sith Lord of all time, AND destroy the Death Star in one day they will have no problem clearing the way to Baghdad.